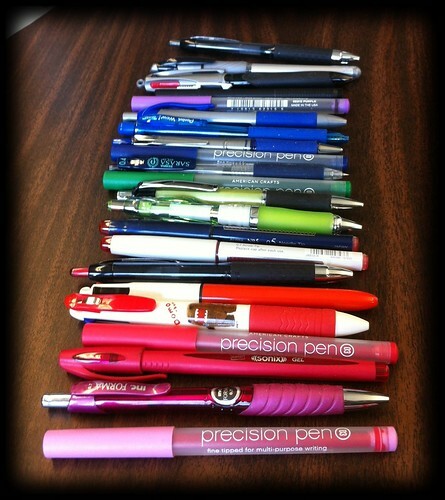 Have you visited JetPens before? If you answered “No” then quickly read through this review and then go browse. I fear if you click now, you’ll be lost in the world of awesomely unique, high-quality writing instruments and stationery products, many imported from Japan and Germany. Seriously, I have spent so much time browsing through their pens, pencils, notebooks, and other goodies over the years. Plus they have top-notch customer service and free shipping on orders over $25. What’s not to love? I was delighted to find an envelope in my mailbox from JetPens. I didn’t make any purchases so this had to be special. 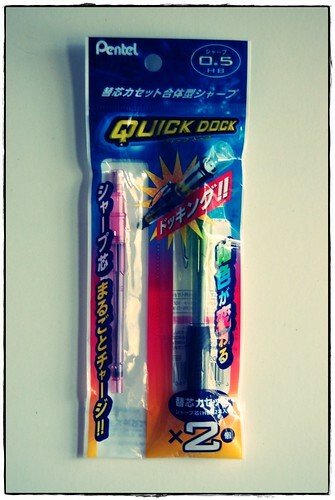 I opened it and, to my delight, found a Pentel Quick Dock 0.5 pencil to review. I love Pentel mechanical pencils and their lead. I own several different models and have very few complaints. 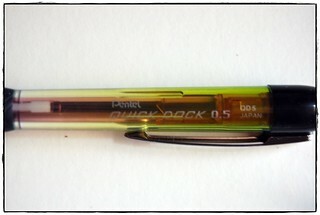 In fact, I own the U.S. version of the Pentel Quick Dock 0.7 already. First let’s take a look at the packaging. The bright colors are eye-catching. I was sent the green pencil body and the pink and blue cartridges. The clear windows let you see the enclosed pieces. The backside has (what I assume) are the directions. 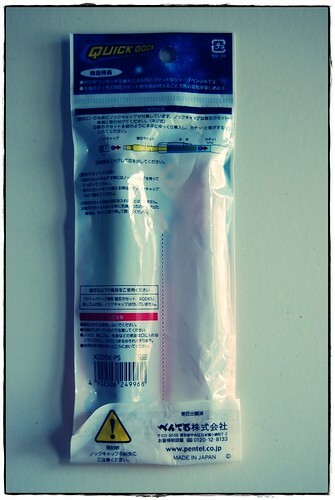 Luckily JetPens includes these on the item page. I was trying to remove the cartridges by pulling on the tiny eraser end. It is MUCH easier to screw on the cap and then remove the cartridges. Thank you JetPens! The convenient cartridge is the main selling feature of the Pentel Quick Dock. If you’re a mechanical pencil user, you have battled those fragile leads. Some pencils let you pop out the eraser and drop in the leads. Lose that eraser and you are so out of luck. Other pencils allow you to carefully feed the lead into the dispensing mechanism. That can be like threading a needle. The Quick Dock eliminates any chance of dropping or breaking the lead during refills. Each of the cartridges come with 12 leads. 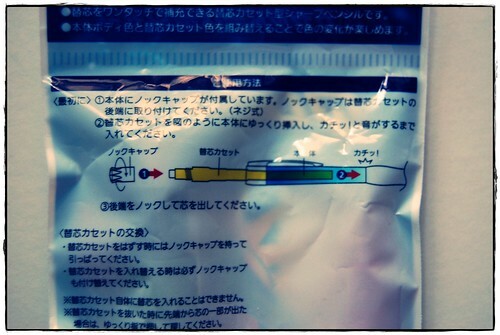 After those 12 are used up, you simply pop out the empty cartridge and pop in a new one. I love this added convenience especially if I run out of lead while away from home. I haven’t tried to refill one of the cartridges yet but I will. If they are not refillable, I’d love to find out if the empty cartridges are recyclable. 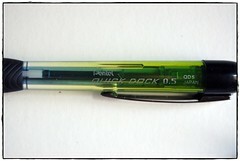 The color combinations are a fun feature of this version of the Pentel Quick Dock. 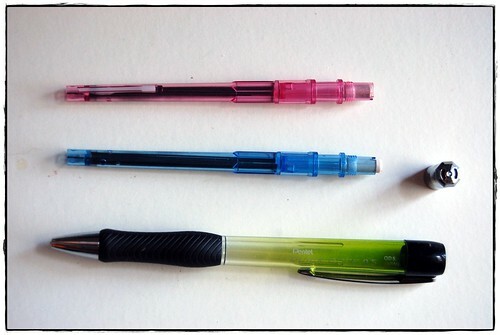 This photo from JetPens shows the variations that are possible from combining three different colored refill cartridges with four available body colors. What a fun and unique mechanical pencil feature! Both versions are comfortable to use and great additions to a #dailyarsenal. 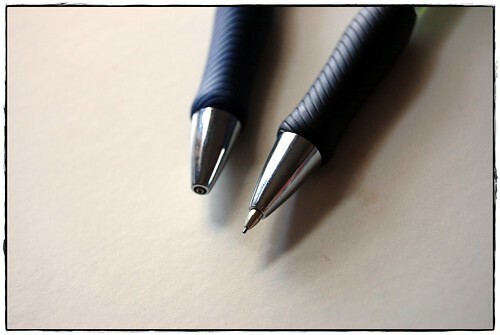 The contoured grip is nicely shaped and ridged for added writing pleasure. I love that the tips fully retract so there is nothing to snag a sweater or jab you if you place it in your pocket and sit down. I’ve come to value both features a great deal. I also like that the clips are metal and not plastic as they are far more durable. The only other notable difference between the U.S. and Japan version is the eraser. The U.S. version has a substantially larger eraser that twists to advance and no screw off cover. This doesn’t have to be a deal breaker. 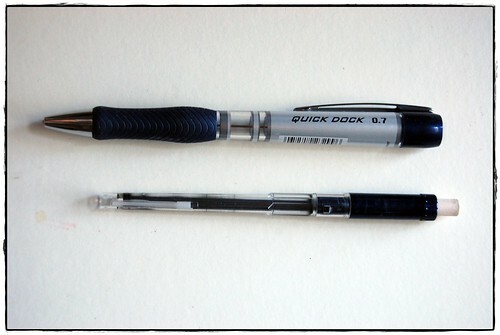 I tend to carry around one of Pentel’s Click Erasers for large erasing jobs. 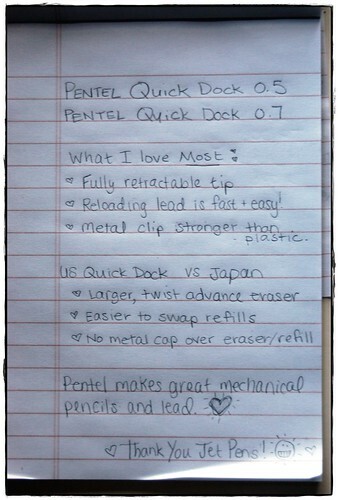 I decided to do a hand-written summary of the Pentel Quick Dock. You’ll see the lead provides a nice dark line and erases cleanly when needed. Overall, out of sheer personal preference, I prefer the U.S. version, but both pencils are awesome. 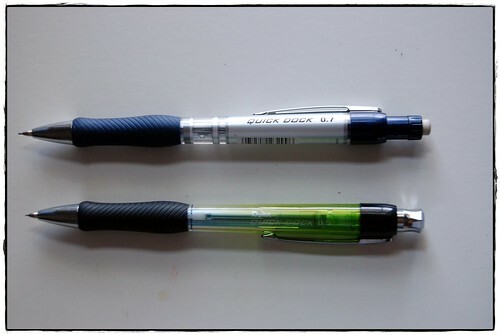 Please note that when I follow the directions, both pencil’s cartridges are equally easy to swap so the main difference is just the eraser/cap. I hope you liked this deeper look at a great pencil. JetPens has four different body colors, each with two lead cartridges for $7.50 and three different color refill lead cartridges for $2.75. 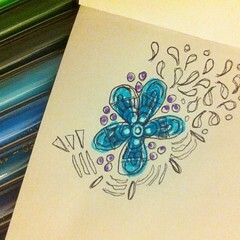 It isn’t the cheapest mechanical pencil option but it is a colorfully fun and convenient one! 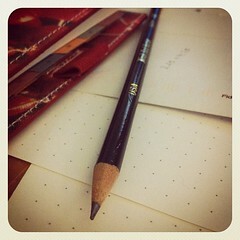 Many thanks to JetPens for supplying this pencil to review. Please note that these opinions are my own and were not influenced by outside forces. I’ve been away from blogging for longer than I planned. In fact, in all honesty, I never planned to stop blogging. I just didn’t want to write about my ankle every post and unfortunately, many days since the collision have revolved around ZeeAnkle. I have learned a lot in the last 8 months – about myself and about the world around me. I really want to start finding balance again and incorporate things I enjoy back into my weeks. So here I am. Are you ready? I have been a stationery addict for years. There is something very comforting about browsing the pen and paper aisles at stores while out running errands. If I’m having a bad day, I have been known to buy something new. It’s functional therapy. Right? I’m hoping to share more product reviews and other miscellaneous ramblings in the near future. Be well.